RestonDigital RestonDigital – Information about Bruce Wright, his artwork, and travels. The first test seemed to work fine. Time will tell. Photos taken with an iPhone are tagged with coordinates. The coordinates can be displayed on a map in Photos, the lat/lon coordinates don’t appear to be accessible in app. 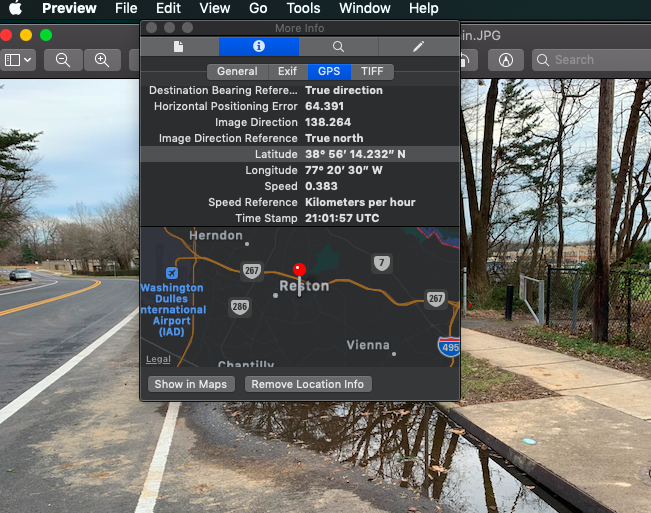 To determine the lat/lon coordinates, export the photo, then open in Preview. Use Tools>Show Inspector and select the info tab (i). One of the options is GPS, which shows the latitude and longitude coordinates. It also lists photo Altitude, Destination Bearing and Date Stamp. Our new Mac does not have a CD drive. I guess no one uses CDs these days. I still cruise second hand shops to look for old CDs, mostly to replace albums I used to own. I have several discs I wanted to enter into iTunes but without a CD drive I needed an alternative. Fortunately we still have the old computer that does have a CD drive. With that computer on the same network as the new computer, it’s possible to enter a CD disc into iTunes on the old computer, then transfer the music files to the new one and then enter the album into iTunes. File sharing must be enabled on the computer with the CD drive, using System Preferences>Sharing>File Sharing. Both computers are using the same WiFi network. On the new computer I used Finder>Go>Connect to Server and Browsed for the old computer. Once connected I could navigate to the iTunes music under Music>iTunes>iTunes Media>Music. The album was then dragged to the desktop and then entered into iTunes using Add to Library and selecting all the songs and clicking Open. I recently downloaded a book in .epub format and wanted to transfer it to my Kindle. Since that format cannot be directly imported, I needed to convert to another format. An acceptable format is .mobi. Kindle makes a free app called Kindle Preview to allow ebook producers to preview what their books in progress look like on a Kindle. The app also converts from ePub to mobi. The ePub format was dropped into the Open Book window and after a while was readable. Once imported the book could be exported to .mobi format. I tried to email the book to my kindle (after finding out the kindle device email address using the Manage your devices option on Amazon, then clicking on Preferences). But the book was too big to send so I discovered that I can simply connect the Kindle reader to the Mac using the usb charger cable. The .mobi file was put into the Documents folder and it then appeared on the Kindle.